Starting today and every Monday I will features upcoming movies in my blog courtesy by Flicks.co.nz and KCFM. For this week line up. 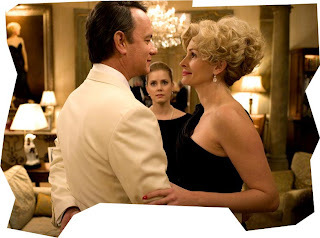 The Charlie Wilson’s War starring Tom Hanks. A comedy/drama based on the true story of Texan congressman Charlie Wilson’s covert dealings in Afghanistan, directed by veteran Mike Nichols (forever a legend for, if nothing else, ‘The Graduate’). “Good-Time Charlie” Wilson (Tom Hanks), a flawed and fun-loving Congressman from East Texas, deftly operates the levers of power to channel money and weapons to the Mujahedin of Afghanistan following the Soviet invasion of their country in late 1979. Charlie finds assistance in the oddest of places – a renegade CIA agent; a Houston socialite; a Pakistani dictator; the Israelis who modify and manufacture Soviet weapons; and a multitude of women.